What better time to whip up a nice warm and cozy scarf than BLOGtober?? I thought of this idea a little while back and figured I'd make it for a post this month. I just finished it up the other day and I think it came out so cute that I am keeping it. Sorry, friends, this one's staying with me! This has been the year of granny squares for me. There was my Vibrant Granny Square Afghan that I entered in the fair. Click the link to see how I did! That afghan took a while and a lot of grannies! I also made a ton of other granny squares for other projects. 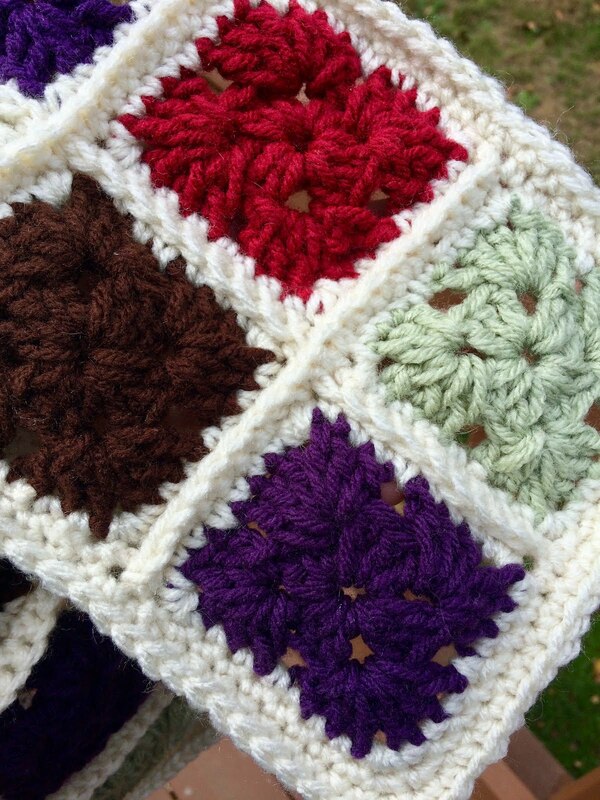 Pretty soon you'll see a pocketbook I made using granny squares. They are so versatile. Here you can see me wearing the scarf. You like my dusty mirror? Wow, I should have cleaned that first. Oh well. Anyway, I think, in hindsight, I would have made the scarf one square longer. I thought with the extra stitching lining the squares it would have been a little longer. This length is pretty good, though. Here's a closer look at the details. 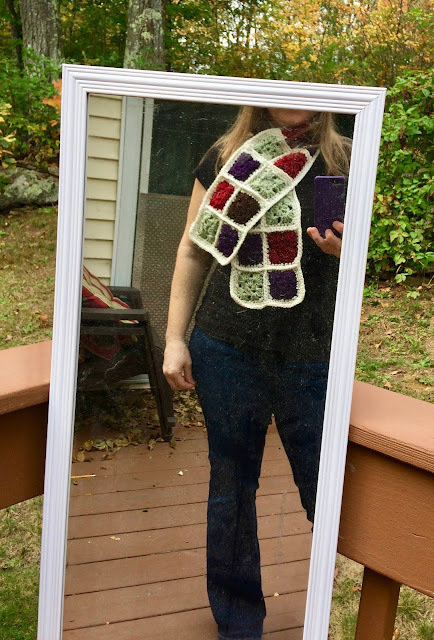 You can see I used four colors for this scarf. I arranged them randomly for a not-so-perfect look. 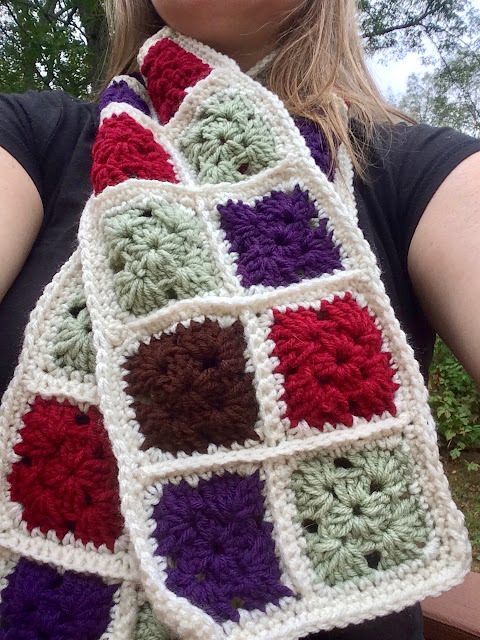 The granny squares were made using a size J hook. I did two rounds and outlined each in the off white using a single crochet. Then I stitched them all together with a single crochet in the same off white. You can see the full pattern below. It was a lot of sewing and tying loose ends to complete this project, but it was worth it. I really like how it turned out. The colors look perfect for fall and yet I know they'll work just fine for winter. Make 28 small granny squares in four colors. You can divide the colors however you like. Chain four. Place hook in first chain and slip stitch to create a circle. Chain two. Then double crochet two into circle. Chain one. Double crochet three. Repeat two more times until you have four clusters. Then join with slip stitch. Slip stitch to corner. Chain two. Double crochet two. Chain one. In the same corner, double crochet three, chain one. Double crochet three into next corner, chain one, double crochet three into the same spot. Repeat until you have two clusters in each corner. Slip stitch to finish. Outline in off white using a single crochet stitch. Sew in all loose ends. 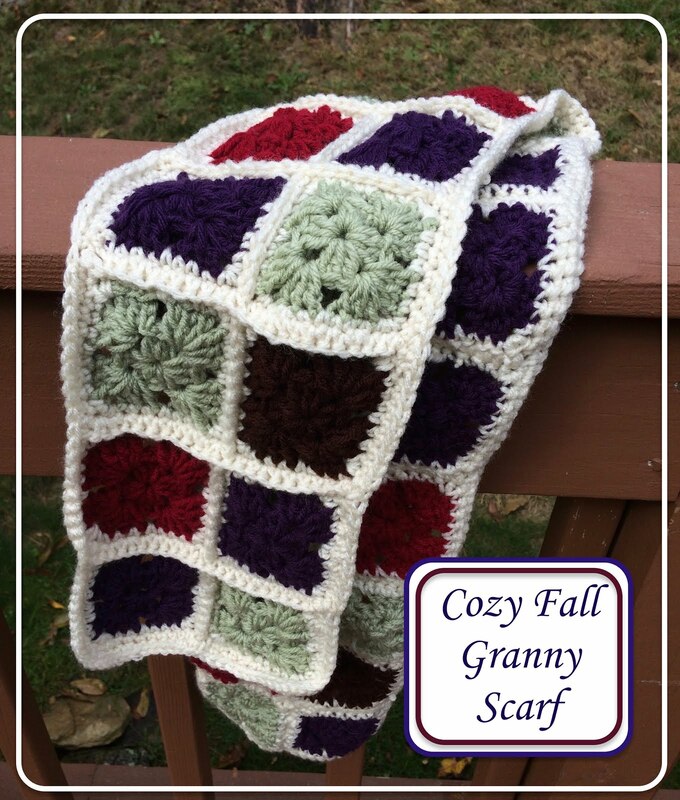 Make 28 granny squares total using the four colors. 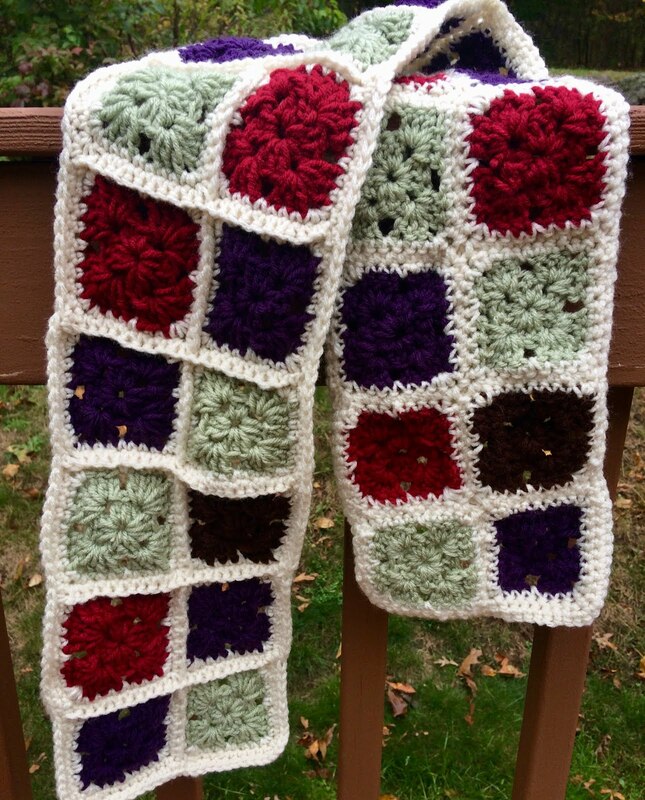 Join squares using single crochet. This is a great video showing how to do this if you need a visual. Make sure to sew in the rest of those loose ends! Any questions? Type them in the comment section below. I'm participating in the Ultimate Blog Challenge! Are you? It might be too late to join now, but you can always join the next one! I recently finished a granny square afghan I started over three years ago. Despite all the sewing it's a great way to use up scrap yarn. I've never made a granny square scarf, though. That's a long time for an afghan! I'm glad you were able to finish it. Let me first say that every picture I take is in a dusty mirror! Love your scarf. It's so comfy-fall! Thanks! And I still haven't dusted my mirror, lol!